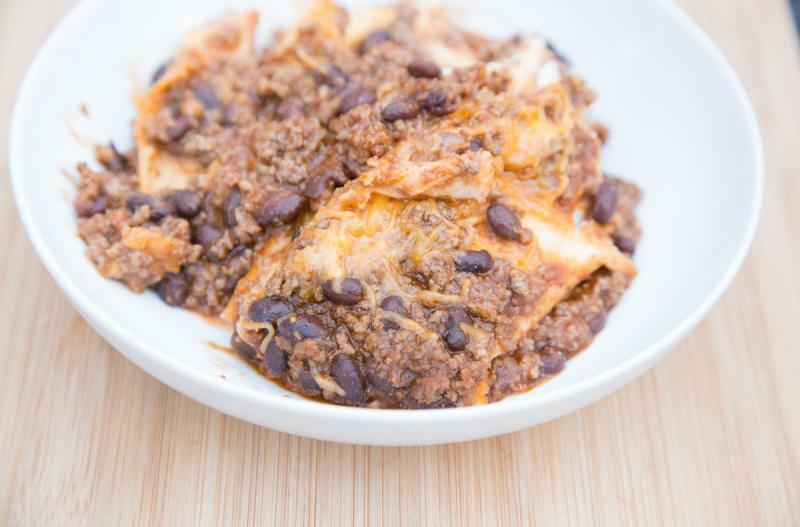 Layered enchiladas are the easiest way to make enchiladas! These are packed with flavor and sure to be a hit with the whole family. Preheat the oven to 400 F. Lightly grease a 9x13-inch baking dish with non-stick cooking spray. Open and drain the black beans. Open the can of green chilies. In a large saucepan, brown the ground beef with the minced onion and garlic powder. Drain and add to large bowl and mix in the salsa, black beans and green chilies. Stir to combine. Add a single layer of corn tortillas to the bottom of the baking dish, covering it as best you can. You might need to tear a tortilla in half to fill in some sections. Add half of the beef and bean mixture, in a single layer onto the corn tortillas. Sprinkle 1/3 of the shredded Pepper Jack cheese over the beef mixture. Add another single layer of corn tortillas, followed by the remaining beef mixture, then sprinkle 1/3 of shredded Pepper Jack cheese over the top. Finally, add a third layer of corn tortillas and top with remaining 1 cup of shredded cheese. 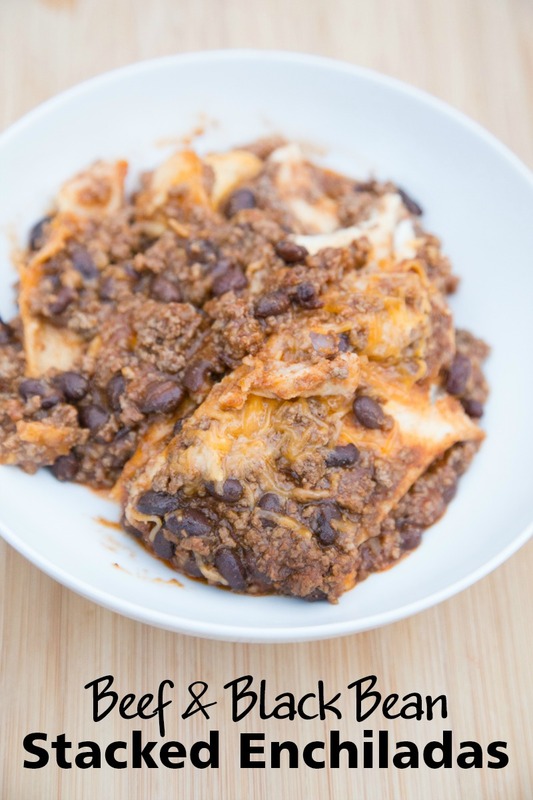 Serve Beef & Black Bean Stacked Enchiladas, topped with guacamole garnish and side of veggies. Open and drain 2 cans of black beans. Open 2 cans of diced green chilies. In a large bowl, mix together the browned ground beef with 2 jars of salsa, 2 cans of black beans and 2 cans green chilies. Thaw completely and bake at 400 F for 25 minutes. Serve with guacamole garnish and veggies.